The foreign thief fell into the turgid river like a stone and vanished. Banipal, the merchant and the young scribe hurried across the bridge to the downstream parapet and watched the surging river for signs of life. Banipal had begun to believe Ekad had judged the man and found him guilty when the scribe pointed far out across the rolling brown water. He followed the man’s arm and saw a bearded face briefly clear the water. A hand clutched at the air then fell back. The body emerged, face down and drifting soddenly with the current. Grim faced, the merchant and scribe turned away. Alone, Banipal squinted into the sun and watched the body, now a black silhouette, drift past the reedy bank beneath the temples of Esagila quarter where Banipal himself lived and studied. Justice had been served yet Banipal felt pity for the foreign man. It was a lonely end, and far from home, with nobody to save his body from the fish and crocodiles in the marshlands downstream. Banipal knew he had been a reluctant servant of Marduk today, only grudgingly visiting his nephew to accept a task he regarded as little more than a chore. 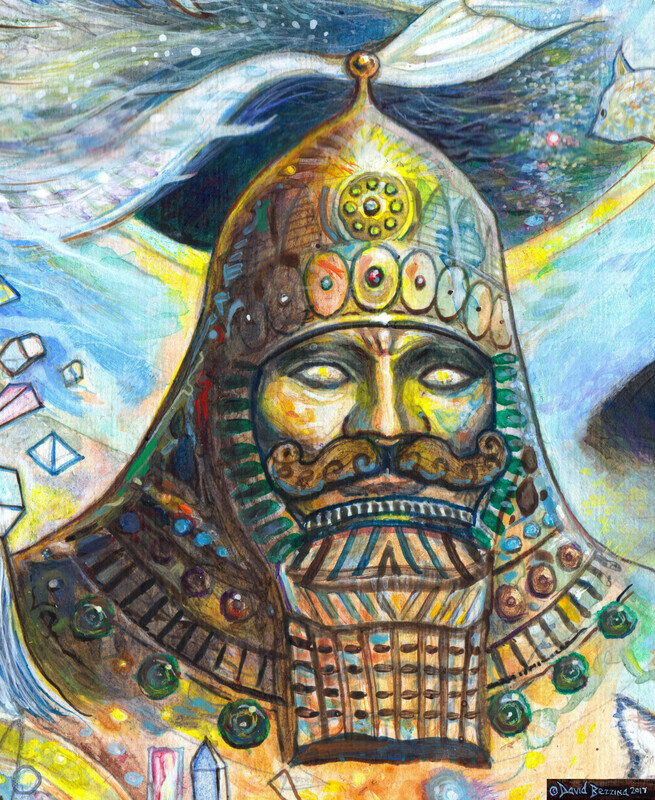 To chide him, great Marduk brought him to Ekad’s bridge at the right moment to witness the lonely foreigner’s fate. The fate of a man abandoned by his gods, yet who held instruments of measurement and scale. The message was obvious. Out of respect for the unknown life chosen to deliver that message Banipal decided to bear witness to the body until it had drifted from sight. After a while he wondered if it was false movement from the reflected sunlight or if the man was in fact trying to swim. Banipal made a fist and peered through the gap between first and second finger. The restricted view cut out glare and focused attention, a hunter’s trick Ishkun had taught him. He saw a half-drowned man struggle with the last of his strength towards the far bank. If he survived he would come ashore beneath the walls of the House of the Raised Head, Marduk’s own temple. Enlightenment came to Banipal like a thunderbolt. Marduk had brought him and the foreigner together for a greater purpose. This was no message – it was a test. ‘Make way!’ Banipal cried, and ran across the bridge like the wind.